Branson Ferris Wheel is making its new home at the Track Family Fun Park in Branson. The iconic Ferris Wheel which stood on Chicago’s Navy Pier for the past two decades is a new attraction to Branson’s Highway 76 this year 2016. This 15-story tall wheel gives visitors the opportunity to get some picturesque views of the Ozarks landscape. As you take a ride with the monstrous Ferris Wheel, you may think of taking a selfie in front of the dazzling structure. Opening this summer, Branson Ferris Wheel is perfect for visitors and guests of all ages. The former Navy Pier Ferris Wheel in Chicago was ridden by nearly 17 million people from 1995 to 2015. This Ferris Wheel has a height of 150 feet, its 40 gondolas can hold 240 riders, and encircling the big wheel are 16,000 LED lights. This fascinating Branson Ferris Wheel boasts panoramic views of the famed entertainment district and the spectacular Ozark Mountains. Don’t miss the chance to watch the Branson Ferris Wheel “Electrify: A Music and Light Spectacular Show which will start at 9:00, 10:00, and 10:55 pm. 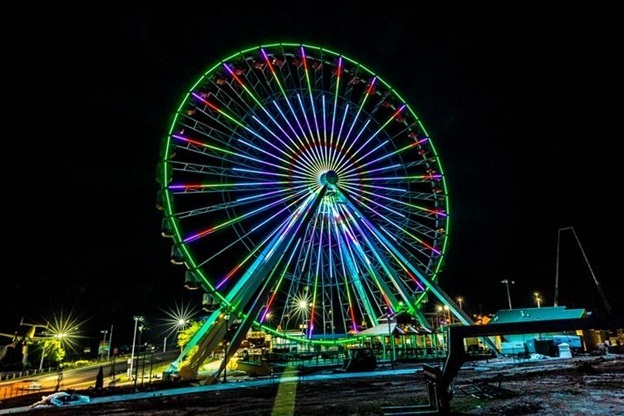 You may not believe that Branson Ferris Wheel features over 144,000 individual lights. The lights are remotely controlled to light up Branson’s sky in an array of colors and animations. But there’s some interesting facts about this Ferris Wheel. The big wheel is built to last for generations. The foundation was constructed using over 4 million pounds of concrete, over 6 million pounds of gravel and 80,000 pounds of steel, and launching areas that go down as far as 23 feet into the solid rock beneath the wheel. In June 21, 1893, George Washington Gale Ferris, Jr. designed and debuted a revolving steel observation wheel for the World’s Columbian Exposition in Chicago. This engineering feat became America’s answer to the recently and beautifully constructed Eiffel Tower in Paris. The first Ferris Wheel that was built at that time was 264 feet tall and was illuminated by 2,500 Edison incandescent lamps as compared to over 144,000 individual lights of today’s Branson Ferris Wheel. The 36 cars of the first Ferris Wheel hold about 60 people each and had 40 revolving chairs, which make a total of 2,160 passengers. The legacy of the Ferris Wheel has lived on to make it one of the most beloved attractions in the world. The Navy Pier Ferris Wheel in Chicago was inspired by the original Ferris wheel. Chicago’s iconic Navy Pier Ferris Wheel took its last spin on September 27, 2015 to make room for a bigger wheel. This Ferris Wheel was a popular landmark in Chicago and become part of the skyline in Chicago for 20 years. The new Ferris Wheel at Navy Pier in Chicago is 196 feet high with 42 climate-controlled closed gondolas. It opened in May 27, 2016. With its move to Branson this summer 2016, Branson Ferris Wheel serves as a new icon in a new setting with many dancing lights.